Something freaky's going on with Sunshine's new house . . . there's the chill that wraps itself around her bones, the giggling she can hear in the dead of night, and then the strange shadows that lurk in her photographs. But the more weird stuff that happens, the less her mum believes her. 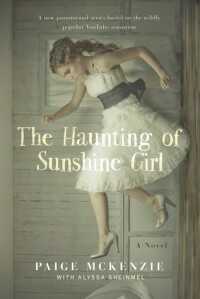 Sunshine's always had a quirky affiliation with the past, but this time, history is getting much too close for comfort. If there is something, or someone, haunting her house, what do they want? And what will they do if Sunshine can't help them? I believe in ghosts, spirits and all sorts of paranormal weird stuff. This book gave me nightmares and made me scream at dark shadows and strange noises in the night. It's a fast quick read because you'll be turning the pages to find out what happens to Sunshine.